Star trails circle above Ayers Rock at night during eight hour time exposure in Australia’s Uluru Kata Tjuta National Park. Photographed February 25, 2009 with a Canon EOS-1 camera and 16-35mm f/2.8 lens. Exposure 8 hours at f/4 on Fujchrome slide film. This entry was posted on Wednesday, February 25th, 2009 at 7:27 am. 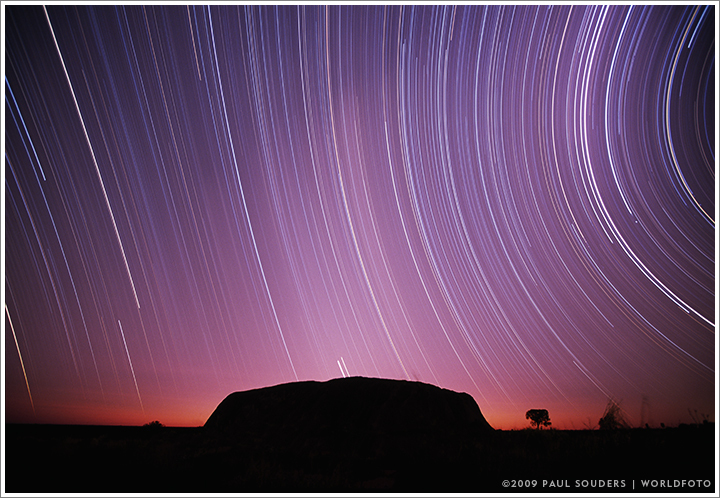 It is filed under On the Road and tagged with Australia, Ayers Rock, Landscapes, Oceania, Time Exposure, Uluru. You can follow any responses to this entry through the RSS 2.0 feed.